Situated in the heart of the Luberon valley in a dominating position and just a few minutes walk from one of France's most beautiful villages, this charming property offers more than 240 m² of living space and has been renovated in classic Provencal style.Access to the house is via a lovely interior courtyard with a fountain: a large living area with dining room and fitted kitchen, sitting room I opening onto a very nice west-facing terrace, an office, TV sitting room II, a conservatory opening out onto a walled garden area, utility room / laundry room with shower, guest WC and cloakroom.Upstairs a beautiful staircase leads to the main bedroom with bathroom (roll-top bath, shower and separate WC), dressing room and private terrace with views of the whole valley. On the other side of the landing, bedroom II with shower room + WC and cupboards.Passing through the interior courtyard you reach an independent studio comprising a small reception area, shower room with WC and a lovely bedroom II upstairs.Heat-pump under floor heating/cooling system, original doors and beams, old style cement tiles and terracotta floors, wood and wrought iron doors.To the side of the house a lovely 16.7 x 2.8 m pool with surrounds in exotic wood overlooks the courtyard. The pool house is designed with a covered area with small kitchen, bedroom IV with shower room, separate WC and cupboards.More than 6000 m² of superb grounds comprising an area of exposed rock in front of the house with pots, fountains and small ponds, and a terraced area with cypresses, oaks, juniper, box, oleander, pines etc. 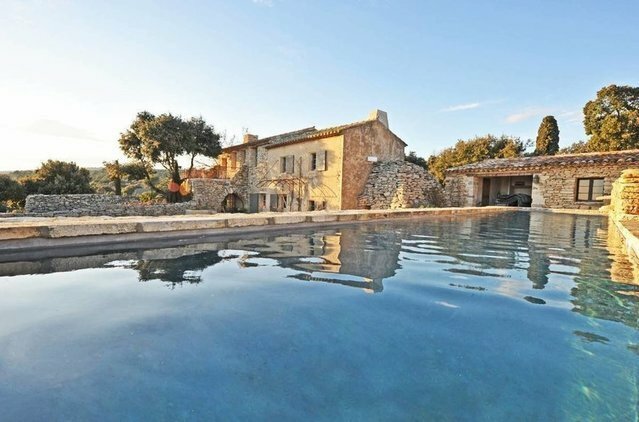 The property offers uninterrupted views of the countryside and the valley from the Luberon to the Alpilles.